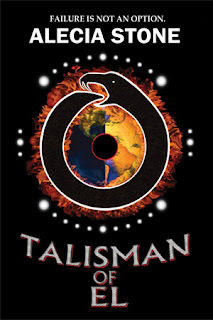 Today for the blogoversary Alecia Stone has taken time out to tell us all about her book Talisman Of El, this is her first ever guest post and I know everyone will fall in love with her story as soon as you read below . . .
About Alecia: Being a fan of fantasy fiction, Alecia Stone's novel was inspired by her love for paranormal mysteries. She loves to write for it is a means of escaping her reality if only for a moment. Talisman Of El is her first book. She lives in the England, UK with her family. Hi, everyone! My name is Alecia Stone, and I am a debut author from the UK. I'm here to talk about my young adult fantasy novel, Talisman Of El, and the inspiration behind the book. When I first started writing Talisman Of El, I thought I was writing a simple story about a young boy who was trying to find his place in the world after the death of his parents. Almost four years and a few edits later, I realise the story has taken on a life of its own. What started as a story about acceptance evolved into a story about destiny and a race to save mankind from a fate far worse than death. Many factors influenced Talisman Of El and, believe it or not, most of those factors were based on real life stories. I'm from the Caribbean, and if you didn't know, strange things happen in hot places. Maybe it's the weather. I don't know. Anyway, growing up, my mother told me so many ghostly and supernatural stories about her childhood that one would think could only happen in a fantasy world. Like, for instance, seeing a creature in a river that had the top half of a woman and the bottom half of a fish. Yes, I'm talking about a mermaid here, people. That's only the beginning. So, now you know where my imagination stems from. Going back to the very first moment in the development stage of Talisman Of El, the story began with a single character, Charlie Blake. The only thing I had was Charlie and his background story. Slowly, as the story progressed and new characters were introduced, I started to see the broader picture. But, it wasn't until I finished the first draft that I realised the story was wasn't what I wanted it to be. So, I scrapped the first version and started anew. During the research stage, I came across an article about a Colonel Percy Fawcett, a British artillery officer, archaeologist and South American explorer who, along with his eldest son, disappeared in 1925 during an expedition to find "Z" - what he believed to be an ancient lost city in the uncharted jungles of Brazil. This lead to further research into people who had disappeared under unknown or unusual circumstances. Now, I've always had a fascination with the supernatural world, so I had fun exploring the depths of my mind to find answers as to why and where these people could have disappeared to, and voila! I had one planet and two worlds. Thus began the creation of the mystical world known as Arcadia. So, with that in mind, I started on the second version of Talisman Of El and didn't stop until I reached the end. When I read it over, I couldn't believe what I had written. It was exactly what I was looking for - a story filled with mythology, adventure, and magic. What I learned from writing this book is that you can get an idea for a story from almost anywhere, but the joy comes from writing about topics you're passionate about. Inspiration is all around us. Just don't go fishing for mermaids. Alecia has kindly offered One *Signed* hard backed Talisman OF EL ARC to one lucky person!! This giveaway is sponsored by the author. It is open to UK residents only! Click on the tab above titled Blogoversary for all info on the 10 day schedule plus info on how to contact the authors involved and about my giveaway and contests. Rafflecopter now available for my main giveaway. Talisman OF EL giveaway is a different giveaway and the form for it is below! What did you think of the Guest Post? What do you think of Talisman OF EL? Enjoying the Blogoversary? Thank you for such a great giveaway. I wish everyone the best of good luck. My fingers are crossed. No problem, Carly. There should be more giveaways to come before the release date in May. In case no one knows, there's also a giveaway of 5 ARCs of Talisman Of El hosted by Goodreads. The giveaway ends March 20. Hi Alicia, it's always great to 'meet' another UK writer of fantasy and someone who also enjoys mythology, adventure and magic. I really love the sound of your book and would love a copy - what a fantastic trailer too! Brilliant. A feature sounds great. You have so many blogs. I'll have to browse through them all. I love reading the behind-the-scenes about books, and seeing how fellow authors create their work. It sounds like you had some wonderful inspiration. I also love the book trailer -- very intriguing! A huge thanks first to Kerry-Ann for hosting the Guest Post and Giveaway. Also thank you to everyone who has entered the giveaway. It's exciting, to say the least. Thank you Alecia and Kerry-Ann!! I want to thank everyone who entered the giveaway and would like to congratulate the winner, AlexSarahLouise. I hope you enjoy the book. This was fun. Thanks again, Kerry-Ann for hosting the giveaway.